‘I declare after all there is no enjoyment like reading!’ – Jane Austen. 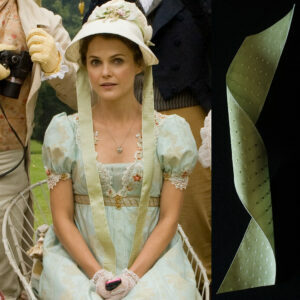 As creators of bookmarks and passionate readers ourselves, Jane Austen is never far from our hearts. Today is the 200th anniversary of the death of her death and to make this occasion, the Bank of England is releasing a new £10 note featuring Jane Austen, as well a limited edition £2 coin. There are also various events taking place across the country, including a minutes silence in Bath where she lived from the time of her father’s retirement until his death – a period of five years. Winchester Cathedral, where Jane Austen was buried will be opening a new permanent exhibition about the author and her life while the Hampshire Cultural Trust is working with Jane Austen’s House Museum and many other partners across the county to celebrate Jane’s creativity and talent. 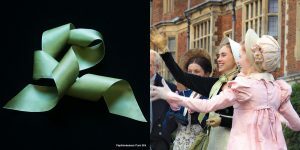 The year will be packed with exhibitions, talks, walks, writing competitions, performances and even Regency picnic packs full of ideas and inspiration to hold a Jane Austen-themed picnic with friends and family. Here at Papilionaceous, we have taken the opportunity to look back at the various films and television adaptations inspired (sometimes quite loosely!) by her novels which have featured our silk ribbons on beautiful Regency bonnets. 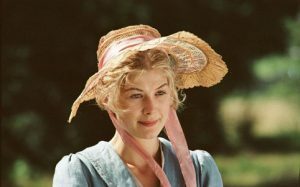 Jane Bennet (Rosamund Pike) wearing long pink taffetta Papilionaceous ribbon alongside Keira Knightly in Pride & Prejudice, 2005.